Founded on June 25, 1997, the Minnesota Wild is an ice hockey team from St. Paul, Minnesota. They are part of the Central Division of the Western Conference in the National Hockey League (NHL). The first season played by the team was in 2000-01 and their first win was against the Tampa Bay Lightning. In the 2016-17 season, the team finished with an overall record of 49-25-8. Their 12-game winning streak in December 2016 set a franchise record. In addition, Chris Stewart, Jordan Schroeder and Jared Spurgeon set a record for the fastest three goals (in just 80 seconds!). In the 2017-18 season, the Wild finished third in the Central Division with 101 points. This qualified them for the postseason but unfortunately lost to the Winnipeg Jets in the First Round, 4-1. With such amazing performances, the Wild are back and have their sights set high for this upcoming season. Led by a talented young core, Minnesota looks to take hold of the Central Division and bring home a Stanley Cup. Division rivals, the Colorado Avalanche and the Chicago Blackhawks will fight to stop the Wild in their tracks. Over the years, the Minnesota Wild have enjoyed quite a few interesting moments. Bouchard’s Spin-O-Rama - In a game against the Chicago Blackhawks on December 5, 2006 at the Xcel Energy Center, Pierre-Marc Bouchard got to show off a particular move of his. It was the sixth round of a deadlocked shootout and Bouchard went ahead to take his turn. With a few swift movements, Bouchard managed to pull off the spin-o-rama, right in front of the father of this move, the Hawks head coach, Denis Savard. The supporters for the team roared with joy after a few moments of disbelief at what had just happened. The Wild eventually ended up winning the game 3-2, breaking their 4-game losing streak. Gaborik’s Five Goal Stunner - On December 20, 2007 at the Xcel Energy Center, in a game against the New York Rangers, Marian Gaborik gave the Wild fans a moment that they would remember for all times to come. He scored five times in the game and provided one assist, making it the greatest individual game for any Wild player. It was indeed Gabrorik’s night, and he got carried off the ice by teammates Sean Hill and Keith Harney. The game was NHL’s first five-goal game in 11 years and gave the Wild a smooth victory past the Rangers, with a final score of 6-3. Minnesota Wild vs. Chicago Blackhawks - This rivalry started in the 2013 Stanley Cup playoffs, when the two teams faced off against each other in the first round. The Blackhawks won five games in the series, igniting a rivalry between the two teams. The rivalry further intensified when the NHL realignment in the 2013 offseason placed the two teams in the Central Division. Adding to the fuel was their meeting in the 2014 Stanley Cup playoffs, in the second round. The Blackhawks again turned out to be successful, in six games. A similar fate met the Minnesota Wild in the 2015 Stanley Cup Playoffs. During the 2015 All Star Weekend that was held in Columbus, the 2016 NHL Stadium series was announced. The first game of this series was played between the Blackhawks and the Wild at the TCF Bank Stadium in Minnesota, on February 21, 2016. Minnesota won this game comfortably 6-1. Minnesota Wild leads the all-time regular series record with 38-24-1-1 and Chicago Blackhawks leads the all-time playoff series 12-3, with a total record of 41-36-1-3, in favor of the Wild. Minnesota Wild vs. Colorado Avalanche - Even though this is quite a recent rivalry, it has managed to gain the attention of fans from both sides. Prior to the 2013-14 season, no one thought much of these two teams. In that season, Colorado came out on top as they beat the Wild in a five game series, 4-1. Soon came the announcement that the first-round opponent for the Wild would be the Colorado Avalanche. The Avalanche fans didn’t think much of this matchup. In a surprising turn of events, the Wild managed to win the series with an overtime goal by Nino Niederreiter. Since that series, the Colorado Avalanche have only been victorious in two out of their ten meetings with the Wild, giving rise to the hatred between the two teams and creating a simmering rivalry. Derek Boogaard – Known as The Boogeyman, Derek Boogaard was certainly one of the most beloved players from the Wild side. He was known as the man who scared many players into retirement, including big names such as Georges Laraque. He was one of the best fighters within the team, he didn’t just beat players, he could easily inflict serious injuries. He once broke the cheekbone of Todd Fedoruk. In his four seasons with the team, he fought 52 times in total. Marian Gaborik - Gaborik played a total of 501 games in a Minnesota Wild jersey with 219 goals, 322 assists and 452 points. He averaged .87 points per game with the Wild. He was drafted by Minnesota with the third overall pick in the first round of the 2000 NHL Entry Draft. He immediately showed his worth, collecting 18 goals and 36 points in his rookie season. The following season was even better as he scored 30 goals and 67 points and also had his first career NHL hat-trick on November 13, 2001. In the heart of St. Paul, the Xcel Energy Center is ideally located in a thriving city center surrounded by museums, restaurants, bars, and parks. There’s almost NOTHING not to like about hockey night at the Xcel Center. With passionate, knowledgeable fans, the Wild enjoy one of the best home-ice advantages in the NHL. Fans can also learn about Minnesota's hockey contributions with the State of Hockey Tribute. The first game this season on the home ground for the Minnesota Wild will be against the Vegas Golden Knights on October 6th. The 2018 NHL season promises to be full of energy. Keep an eye out for these Minnesota Wild playoff tickets if you don’t want to miss any part of the fun. Our process for purchasing cheap Minnesota Wild tickets is simple and fast. There are so many online ticketing sites, that it can be hard for customers to find the right place to buy Minnesota Wild tickets at the cheapest price. At ScoreBig we think of our customers first and foremost. We offer daily deals for Minnesota Wild events, so our customers can get the best seats for the best prices. ScoreBig will always go above and beyond to offer the cheapest Minnesota Wild tickets on the market. The Minnesota Wild schedule above, displays all available events for 2019 and 2020. Once you find the event that you would like to go to, click the red “Get Tickets” button. It is located on the right-hand side of the event listing, it will take you to an Minnesota Wild event ticket page. ScoreBig's event ticket page will display all available Minnesota Wild tickets for that event. On the event ticket page to help with your search for the right Minnesota Wild tickets, use the filters at the top to select quantity, price range, and more. There is also an interactive seating chart so you can pick where you want to sit. When you are ready to buy a ticket, click on the listing, and you will be directed to ScoreBig's checkout page. Upon completion of the information fields, your order will be processed and your Minnesota Wild tickets will be delivered via email, mail, or to your mobile device. What makes ScoreBig’s site stand out from the rest? We are constantly analyzing our competitors to improve our site, service, and prices. ScoreBig.com employees strive to offer the best process and experience to buy cheap Minnesota Wild tickets. Our goal is to get you the best seats to Minnesota Wild events. We offer daily discounts on our site and for special promotions check out our newsletter. If there are no Minnesota Wild events currently available, you can use our search feature at the top of the page to see a list of all popular events going on near you. No matter your price point, we have all the best deals and discounts on Minnesota Wild tickets. For more information on prices of Minnesota Wild tickets and the schedule for Minnesota Wild, check out our listings above. The last thing you want to find out is when the Minnesota Wild event you wanted to go to is sold-out. Don’t worry in many cases ScoreBig has affordable tickets to sold out events. We sell tickets from GA all the way to premium seating and parking. Skip the scalpers in the parking lot and get your tickets online from top Minnesota Wild ticket brokers. We get you in all events, buy your Minnesota Wild tickets here from a brand that many trust and rely on for all their ticketing needs. ScoreBig offers a 100% money-back guarantee. If you have been in search of cheap tickets for Minnesota Wild, ScoreBig by far is the best option. That’s why ScoreBig has more loyal customers than any other ticketing site. 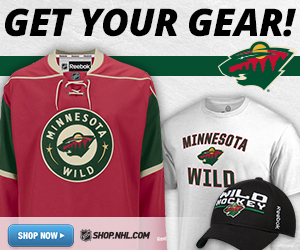 Shop at ScoreBig for safe and secure Minnesota Wild event tickets.